"Its only a night, only a moment..."
As I explore the MpS Galaxy, I can't help but notice the generation gaps. Like the gaps between Brady Bunch and The Hills; between Lost In Space and BSG. Gaps in the way our clients, OEMs and we see our position in this digital realm; IRL. We, and by we, I mean us in MpS old enough to remember ditto machines, black boards, automobiles with ash trays, 73 cent/gallon gasoline, Schoolhouse Rock and Iron Eyes Cody, are so deep into how technology effects the corporate world, we sometimes miss the point. Too deep in the forest to see the trees. It can't be helped, we see things through a lens ground into shape by our personal past. Up until 3 days ago, I had only heard the name, Thirty Seconds to Mars, not their music. This song caught my ear, listening to the Sirius Top 45 countdown. I wasn't overly impressed, but interested enough to look them up on YouTube. There is a young, U2 feel. I saw one or two Billy Idol moves; the gloves are Billy all the way - or Duran Duran. Angst? Hell yes, but didn't every single generation think their time was 'the end of the World'? Don't all kids feel Lost and circle themselves together? Since Elvis, music has attracted the like minded; like spirited. Counter insurgents, Contrarians, the idealistic youth. This generation is no different than all others before them with one exception - the full integration of Technology into every corner of their world. Closer to The Edge. Which, is of course, our world too, Closer to The Edge. Here it is, these kids don't know what Star Trek is - well, they may have seen one or two eps. - but they don't KNOW. Unlike my generation, today, communicators and cool technology are 'table stakes'; our imaginary jump off point included wooden sticks and cardboard phasers. Today, its Wii and Smart Phones. The lead singers red mohawk is the first some of those kids ever saw, the first one in history. They don't know where Woodstock was, what the Beetles are, and probably consider U2 a bunch of elderly guys who sing old fashioned tunes. They've never 'flicked a Bic' to bring on an encore. Instead, they hold in their hands illumination given off by more technological power than utilized getting to the moon. In the palm of their hand. And they take this all for granted; like we take electricity - heck, some of my contemporaries still don't take the internet(the Cloud) for granted. These youngins do. The world is more connected then ever - duh. The 'yudes' are all over every technological advancement - they expect to communicate with Prague, London, Detroit, and LA all at once and in real time. Their sense of community is digitally based, at the speed of thought - 15 minutes ago is ancient history. And print is too slow. Look at those kids. Now consider your own. In 8 years, do you think your kids will be selling those kids, copiers? Ohh... I hesitate to comment as I generally like to sit on the sidelines and watch. But you raise some very interesting points that I feel compelled to add my 'two- cents' worth to. I feel like I am having an identity crisis right now though because I can identify with all the 'older' references you made and yet I would be classified as the 'younger' generation; I think. I grew up with 'The Next Genereation', went to a David Bowie concert, and grew up riding in the car without a seat belt. I know what an Atari is, and I had a collection of LP's and 45's. I grew up with technology from the first brick-phone to the crackberry that I carry around with me now. I also had a computer in every classroom and all my assignments HAD to be done on a word-processor program. For the older generation technology was more of an option you could choose to adopt. For my generation technology was ingrained and integrated into the way we were raised. Technology was a part of our culture. I've watched this industry go through some amazing growing pains over the past four years when it comes to the MPS conversation, and it still baffles my mind when people don't get it, or see the value. Because an assessment is more time consuming and doesn't produce immediate revenue sales people don't want to do it. To me, it just makes sense, once you've done the assessment and gained complete understanding of the environment - you OWN that account. I see the gap as a hinderance and a benefit. The 'Copier-Guys' that have been in the game for 10-30 yrs look at me with disdain when I try to talk to them about MPS and I can almost hear the thought - "what the hell can she tell me about MPS and how it'll affect my business, I've been doing this for 30 years" - it is communicated in the polite smile and nod of the head. My response, "yeah...how many boxes have you sold in the past three years? How many deals have you lost to a competitor ofering MPS? What do you mean you aren't manging their Laser devices? WHY NOT?" When I can actually get someone to listen to me I get a lot of "ohhh....I never thought of it that way". Perhaps the benefit of the influx of 'fresh blood' into the industry will mean some more innovative thinking. There is a different perspective and a rediness for change that comes with 'immaturity'. I think part of the problem with the gap is that the youth are trying to hard to bully out the older generation and the older generation are digging in their heels because they know the way things have been done. The most productive and innovative companies and people that I have had the pleasure of dealing with are those that are willing to take the best of both worlds. The 'young' learn the way things were done, and offer a different way that might work better. We're coming your way ready or not. 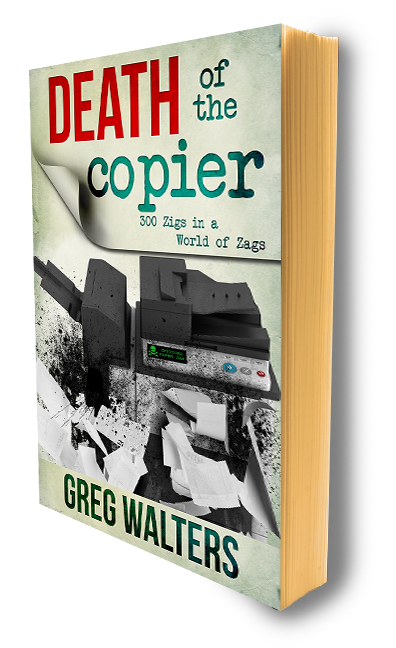 Greg's right your kids will not be selling copiers, but cloud solutions, wireless printing devices, and 3-D Printers (http://www.youtube.com/watch?v=ZboxMsSz5Aw) - print will NEVER go away completely but there will be new products and most importantly solutions that they will be selling. Thank you for your comment and for reading DOTC. You make some really good points. A very nice reflections.